Need someone like me to take care of your wildlife problems? Click on my nationwide directory. 05.22.2006 - This is a photo of a juvenile bat. The species is Evening Bat. The females usually give birth in mid-April, so this specimen is probably about five weeks old. I found it exactly as photographed here, lying on its back on the kitchen floor. I hadn't handled a baby bat before, as I do no bat work during the summer maternity season, when the young bats are unable to fly out of the house and therefore unable to fly out of my one-way bat exclusion nets or funnels. However, in this case the baby bat had wandered down from the attic, through the walls, and out into the house, so I came out to get it. In handling the bat, I found out that it possesses a talent of which many baby animals seem to excel - clinging. Baby opossums are probably the best, but this bat was incredibly clingy. The thing was downright sticky! If I put a finger near the thing, it was latched on, and very difficult to get off. In the above posture, it's on its back, wings slightly arched upward, toes spread, ready to stick on to anything that might pass by. It was literally as if my hand and this thing were made out of velcro brand hook-n-loop fastening material. I was so moved by this, I had to blow my nose using kleenex brand personal hygene facial tissue, and make copies of the photo with a xerox brand paper copying machine. There's not a whole lot else to say about the physiology of the juvenile bat. It was pretty much like most babies - a smaller, more helpless version of the adult, with a gummy smile and an annoying whine. There was one notable exception. Many people think that baby animals are cuter than their adult counterparts. This is usually true, on evolutionary theory that it helps in motivating care for the young. (Although "cute" is subjective enough that this could be yet another cart before the horse theory). Anyway, the theory didn't hold for bats. I'd say that this baby was UG-LY! At least the adults are a bit fuller and fluffier. I've read that the young can fly in as little as twenty days of age, but I do not believe that this one could. I didn't perform a test. A simple toss into the air usually solves the puzzle of whether something can fly or not - worked in some of the Salem witch trials, I've heard. However, since a bat is far more sinister and deadly than a witch, I didn't want to risk seeing it get away, as several of the true witches in the trials did. Also of course, I didn't want to see the result that the "toss in the air" test had on the innocent witch suspects. I believe the technical term was called splat. 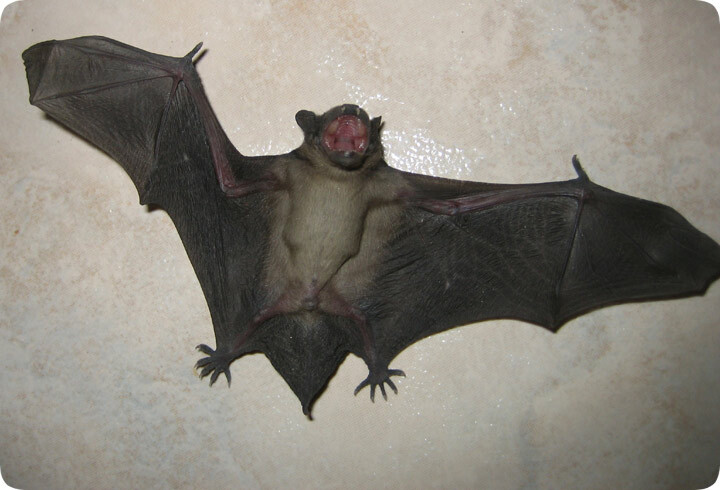 I mentioned in the 5.21.06 blog post that I caught an adult Evening Bat in a home, and that it had entered the house searching for its baby. I did not find the baby bat on my first trip, but the homeowners called me the following day, because they had. As is usually the case with bats, when it wanted to hide, it remained well-hidden. I can't stress enough the ludicrous ability of bats to squeeze into tight spaces in order to hide - a gap between the cabinets, in the curtains, behind a picture frame - there's no telling where they might be. However, people often notice them when they emerge at dusk and start to fly around the place. In the case of this flightless baby there was no hysterical flinging of the hands in the air in an attempt to keep a bat out of the hair. The baby bat simply crawled out of its hiding place and started calling for mommy. I had already released mommy back into the night sky a day before, so I removed this one and put it back near the entrance of the attic, where I hope it was retrieved. Mothers are usually good about that - and ignore that crap about "if a human has handled it, the mom won't take it back". It aint true.